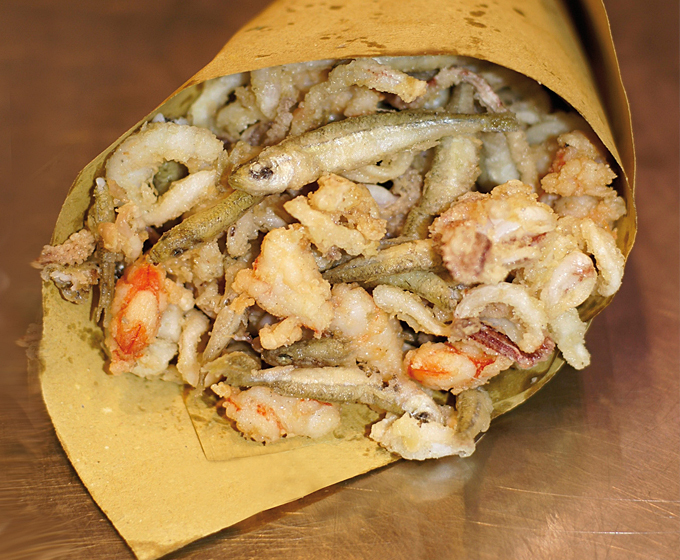 In the port of Genoa since the second half of the 16th century there was a custom of frying fish. All the inexpensive fish which could not be sold on the daily market, plus all the fish left over after the cleaning and the preparing, was floured and fried in huge frying pans over open fires. The oil used was Taggiasco Extra virgin olive oil, which was the only oil locally available at the time. The fish was fried and sold around the port in portions, which were served in brown paper cones at very cheap price. This was a common meal for sailors, dockers and travelers passing through the docks. Up to this day, in Genoa and all over Liguria, during saint days and feast days you will find the popular tradition of frying cheap fish or Mediterranean fish such as anchovies, sardines and mackerel in large communal cauldrons. It seems that a Portuguese man of Jewish origin, who was en route from France, ate many cones of fried fish whilst waiting at the port of Genoa in 1858. He was on his way to London and decided to set up the same type of meal at his port of destination. Because the abundance of cod in the North Sea and because there were no anchovies, sardine or mackerel, or Taggiasco oil for that matter, he had to modify the recipe. He also added find potato chips, which he had seen and eaten during his previous stay in France, (now belonging to Belgium). There were various attempts and modifications trying to adapt the recipe to local availability but eventually the idea was successful and the first fish and chip shop was opened in the port of London in 1860. It was a great success. From London to the whole of the United Kingdom, Ireland and Scotland, fish and chip shops opened everywhere. The shops were soon to arrive in all the British colonies, Australian and South Africa, New Zealand. Fish and chip has become the classic of the English cuisine that owes its great success to the Italian cuisine and in particular to the Genoese maritime tradition. Drawn from Fettuccine Alfredo, Spaghetti Bolognaise & Caesar Salad by Maurizio Pelli. For info: The Culinary Clinic by Maurizio Pelli.